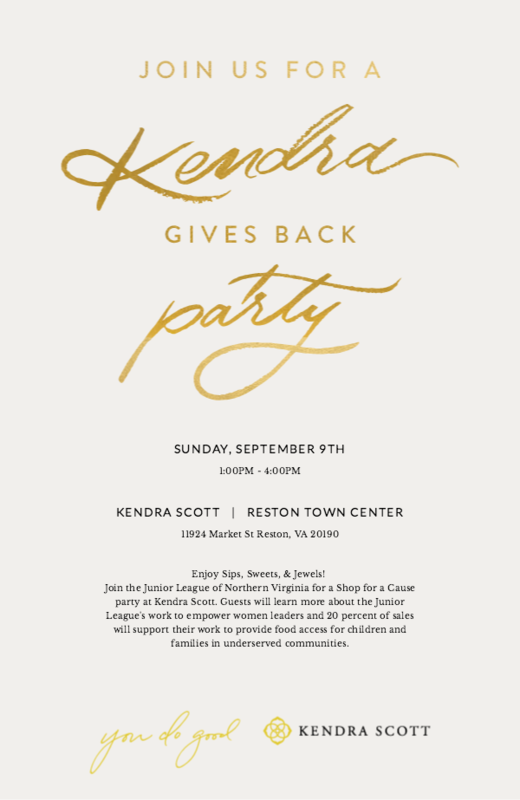 Join us on Sunday, September 9th for a special afternoon of Kendra Gives Back! 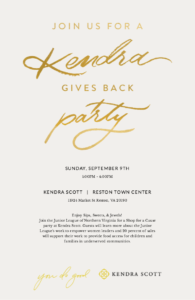 From 1-4 p.m. 20% of all sales in the Kendra Scott Reston location will be given to the JLNV to support our mission! Out of town on the 9th or have a family member/friend who cannot make it in person? Don’t worry! You and your guests can place orders over the phone or by email that will count towards the JLNV total. Call on September 9th (571-599-7792) and put items on hold/share payment information. Make sure to mention the Kendra Gives Back/JLNV event so that the purchase can go towards the Kendra Gives Back to the JLNV! You can also reach out via the store email, restontowncenter@kendrascott.com, earlier that week to put items aside and then call in on the 9th with your credit card information. So, check out the new fall collection highlighting African turquoise, brown tiger’s eye and pink rhodonite! Or pick out a classic piece that you can wear yourself or gift to that special person! It’s as easy as 1-2-3, shop Kendra Scott while supporting the JLNV!